At Chefhelp we work pretty hard at keeping our customers informed, below are just a few recent press releases that have been published in local Dorset media and country wide Catering publications. Now that the hectic festive season is out of the way, why not take the opportunity of a slower January to make some New Year’s Resolutions for your business? Taking the time in January to review the last year is a must for any business. You can see the peaks and troughs and clearly identify the months where you may have to work a little harder to win business or retain customers. Chefhelp have put together these seven cracking New Year’s Resolutions to help make 2011 your year to thrive. Where do you want to be this time next year? Just setting goals focuses the mind for you and your team, giving you all a common goal. For example, you might want to increase the number of covers served or reduce costs in certain areas. Customers always remember a bad meal, not a small meal. Focus on high quality produce with perhaps slightly smaller portions. Focus on profit rather than turnover. Get your portion control in check and in the current climate demand best prices from your suppliers. Make 2011 the year that you embrace your customers and keep them coming back for more. Focus on treating every customer as an individual and make their dining experience truly wonderful. Think about how some in house training could improve your relationships with your team and your effectiveness in the kitchen. A couple of hours a month on food presentation could work wonders with your customers. Look at how you communicate with employees and customers. How can you improve? Is it time to embrace social media? Sometimes, investing a small amount to have a fresh pair of eyes review the way you do things can pay huge dividends. Chefhelp can review your kitchen operations, ensuring your kitchen runs in the most effective, economical and efficient way possible. There’s a buzz around the office at this time of year with Christmas parties fast approaching, but what are people saying? “Food at Christmas parties is never great”, “You can’t expect great quality when they’re catering for that amount of people”. With the right help, you could turn this negative, but sadly often correct, perception of Christmas parties into a positive, customer winning, experience for your business. Dorset based Chefhelp are here to show your business how to turn chaos into calm, shocking into super and ensure all your Christmas season customers and queuing up to return to you in 2011. 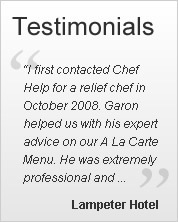 Dorset based Chefhelp is a life line for catering and hospitality businesses throughout the region. ‘The Season to be jolly’ is a high turnover time for hotels with ‘Turkey and Tinsel’ and Christmas Party nights in full swing. Unfortunately, this jolly season also coincides with winter, the season on colds and flu, which can play havoc with kitchen planning and catering – if you don’t have a Plan B in place. Garon continues: “At Chefhelp we encourage Head Chef’s and Hotel managers to have a ‘Plan B’ in place to ensure they can quickly and easily overcome occasional problems throughout both the festive season and all other times of the year. Whether it’s a planned event, such as holiday cover, or emergency sickness cover that’s where Chefhelp comes in. Chefhelp allows your business to continue to deliver the high quality and service your customers expect despite these issues. With our extensive industry experience in top restaurants, Chefhelp can also assist on a consultancy basis, where a kitchen may want to improve food quality, or streamline the delivery process to provide better service”. Chefhelp is fast becoming the most recognised name in the south for providing professional relief chefs to hotels, restaurants and private residences at exceptionally competitive prices. Poole Yacht Club is a keen advocate of Chefhelp, having had the position of Head Chef filled by Dylan Taylor. Manager of the Club, Mark Fulton says “the service Chelhelp offers is fantastic – quick, reliable and very cost effective. We are really happy with Dylan and would not hesitate to recommend Chefhelp when recruiting staff”.